Last week, there was an Extra Credit task to use a UISlider to show the history of the currently-being-played game. This week we’re going to make showing the history a Required Task, but instead of using a slider, you must invent yet another new MVC which displays the history in a UITextView and which is segued to inside a UINavigationController. It should show the cards involved in every match or mismatch as well as how many points were earned or lost as a result (you are already showing this information in a UILabel for each card choosing, so this should be rather straightforward to implement). Add a bar button item “History” on the right side of the navigation bar which performs the push segue. This feature must work for both the Playing Card game and the Set game. 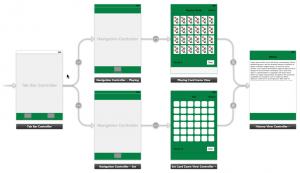 In storyboard embed both game view controllers into a navigation view controller. Because the usable space decreases remove a row of cards and adjust the layout. Add titles and history buttons. Add a new view controller and click-drag from both history buttons to the new view controller. Set the segue identifier of both of the new segues to “Show History”. Set the title of the new view controller and add a text view.